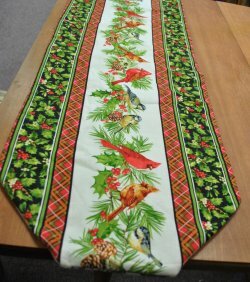 Want to make some quick gifts ---maybe for Christmas? or birthdays? 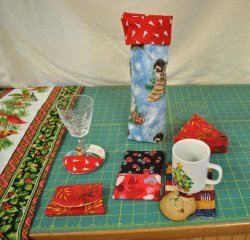 Saturday, July 30 we will be making mug rugs, wine glass coasters (how to tell whose glass is whose), wine (or any kind of bottle) bags, pillowcases, a gift box, handy helper jar opener and a table runner. The class is from 10 am to 2 pm. $25. for a day of creative sewing. Optional supplies: If you are going to make the pillowcase, you need 3/4 yd. for the body, 1/4 yd. for the cuff and a 2" strip for the accent. You will need 1 1/2 yd. x 20" of main fabric for the tablerunner, and 1/2 yd. of border, 1 yd for backing. And, yes, Obi will be here to supervise our progress.